I do consider it my sworn duty to inform you when Charlene is looking particularly good. So consider yourselves notified: Charlene's looking gooood. I can't really even put my finger on what exactly I like about this look, because I like all the things. 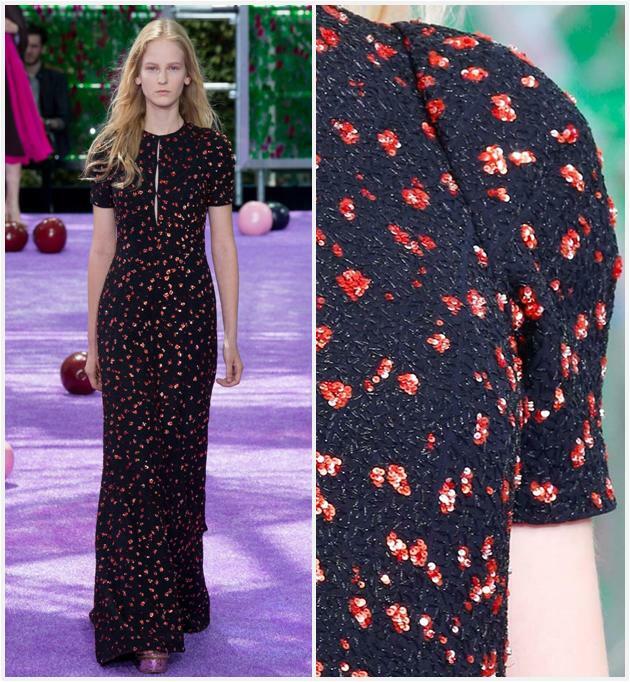 The shape, the sleeves, the way the sequins create an abstract floral look, the navy and red with the red lip. All the things! The dress is by Christian Dior Couture. In case you were wondering why she has a recent fondness for the couture house, it's because they are the current sponsors of the Princess Grace Awards. But the longer she wears Dior, the better their creations seem to work for her, so this is turning out to be a relationship with more than one benefit. Oh! And! More new earrings. Rubies and diamonds from Graff. As you do. Charlene's floral-esque dress reminded me of a recent long floral worn by Crown Princess Mary to a party last month. I'm tossing it in here, just for good measure. I love that she paired this with her aquamarine girandole earrings and a bright blue clutch - you know I love me some statement accessories - but...hmm. Hmm, Mary.